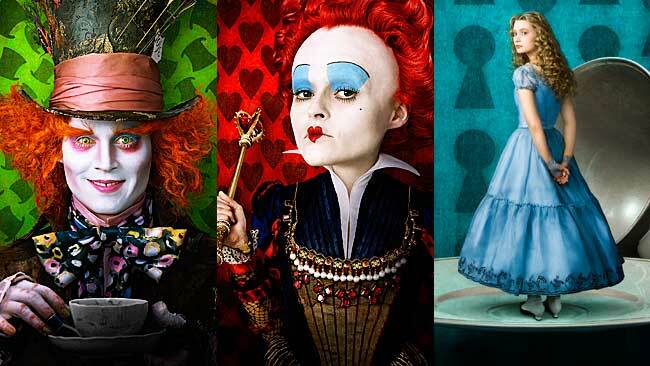 The three main characters from Alice and Wonderland. Delightfully mad. Full discloser, I like to look at pretty things. Bold colors with graphics that carry a statement delight me. When I first saw the above three images, I was giddy. The bright hues, the whirling patterns, the thought of that ginormous head in 3-D… I was ready for the movie to come out. The movie I saw in my mind was mad-cap, fast-past and full of wit and with splashes of terror (obviously, it’s a Tim Burton film, and the original source is no picnic either). But when I actually saw the movie over the weekend I thought it felt like there was something lacking. It’s rather telling that, in comparison to the promotional pictures, much of the movie is a little muted. The current Wonderland is in a state of tyranny because the Red Queen rules with an iron ax and will see to it that heads will roll at, well, the drop of a hat. But I knew the film would be dark going into the theater, so I was less surprised by the dimmed hues and more surprised by the fact that, despite the seriously amazing animation and well used 3-D, I never quite felt like I’d fallen down a rabbit hole. Johnny Depp as the Mad Hatter wasn’t as gleefully psychotic as I was hoping for, but he did carry a heavy burden from a past pain; the Hatter is dirty and often looks out into space as he sees what could have been destroyed all over again. But for my money, if there’s tragedy, I want tragedy! If there is a raucous fight a-brewing, I want it to be head-bangingly awesome. I want everything! Many people didn’t like, Tim Burton’s retelling of Charlie and the Chocolate Factory, but I actually really enjoyed it. I thought it was fun and zany and carried a quirky tone of well, but I think people complained that it was just “too Burton” for a family movie. To that I say, “tough.” Movie retellings don’t have to be exactly faithful to the same audience as before, they just need to bring something fresh to what was already (in general) a good film. This holds especially true for this Alice and Wonderland considering that Alice is all grown up. She’s facing an engagement and a battle with a Jaberwocky, both futures hold some bite so why didn’t this movie have more teeth? All-in-all the film wasn’t bad and it was definitely enjoyable for what it was worth (I paid student ticket price- don’t judge) and it was very lovely to look at (the Cheshire Cat was divine, floating and swirling and evaporating into nothingness, very fun to watch him flit across the screen) and the voice actin was fantastic, but it wasn’t everything I’d hoped for. Maybe my expectations were too high, but it just wasn’t as full of wonder *cringe* as I was hoping for. But then, it’s not an easy task to take a source so full of imagination and twists and make it a reality that’d fit everyone’s dreams. Anyone else seen it yet. Thoughts?